Inspect your battery’s voltage and terminal connections with the engine on. Use a voltmeter to determine if the battery is producing a charge. You should get a reading of anywhere between 13.8 and 15 volts. If the reading comes in below that range, you may need a new battery. If you hear a loud, grinding noise, you may be hearing the rotor failing within the alternator itself. To test whether or not this is the problem, take one end of the heater hose or tubing and put it next to your ear while moving the other end close to the alternator. If the volume increases, you need a new alternator. Check the wires or cables that connect to your vehicle’s starter. If they’re in good working condition, then you can rule out an electrical problem. But if the wires are worn, rusted or if they’re damaged in any way, you may need a new starter. Remember, if it’s something serious, like brakes, tires, or another problem that jeopardizes the safety of your car’s passengers, it may not be a good idea to diagnose and try to repair a serious car problem by yourself. 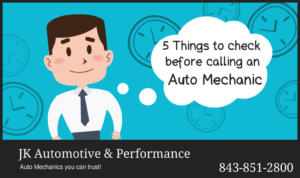 You should rely on a trusted and trained and certified auto mechanic. We welcome the opportunity to earn your trust and we offer a full range of auto repair services.